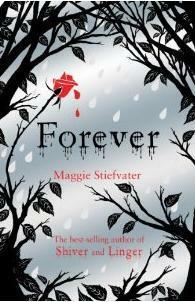 "The thrilling conclusion to #1 bestselling Wolves of Mercy Falls trilogy from Maggie Stiefvater. In Maggie Stiefvater's Shiver, Grace and Sam found each other. In Linger, they fought to be together. Now, in Forever, the stakes are even higher than before. Wolves are being hunted. Lives are being threatened. And love is harder and harder to hold on to as death comes closing in." Source, Goodreads. Forever, the third and final (and best in my opinion) instalment in the Mercy Falls series. But first lets start with that front cover . How pretty is that?! When it comes to front cover I really do have a bit of magpie in me. Anything shinny and pretty I will pick up, and forever was no exception. Well actually it was, as I got it as a gift from my husband for my birthday. The US version of this book is not as pretty in my opinion but each to their own I guess. Now onto the plot. Forever follows the story of some of the characters in Linger (see no spoilers.) There are more twist and turns in this book and though most are predictable I enjoyed going along for the ride. There's not a great deal I can say about this book without spoiling the other two books but I will say I enjoyed it a hell of a lot more that the other two. Though saying that I don't believe that the ending was as satisfying as it could have been. Now I've read quite a few of the book reviews on goodreads and though a lot of people agree with me there are a lot who thought it was perfect. I guess I'll leave it up you to see who's side you take, but whatever you do don't let it put you off from reading it.